The Battle of Brandywine, also known as the Battle of Brandywine Creek, was fought between the American army of General George Washington and the British army of General Sir William Howe on September 11, 1777. The British defeated the Americans and forced them to withdraw toward the American capital of Philadelphia. The engagement occurred near Chadds Ford, Pennsylvania during Howe’s campaign to take Philadelphia, part of the American Revolutionary War. 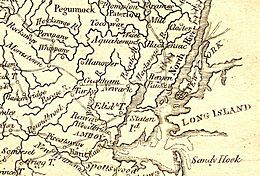 Howe’s army sailed from New York City and landed near Elkton, Maryland in northern Chesapeake Bay. Marching north, the British Army brushed aside American light forces in a few skirmishes. 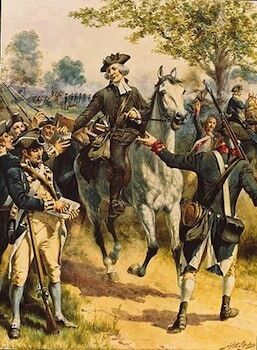 Washington offered battle with his army posted behind Brandywine Creek. While part of his army demonstrated in front of Chadds Ford, Howe took the bulk of his troops on a long march that crossed the Brandywine beyond Washington’s right flank. Due to poor scouting, the Americans did not detect Howe’s column until it reached a position in rear of their right flank. Belatedly, three divisions were shifted to block the British flanking force near a Quaker meeting house. After a stiff fight, Howe’s wing broke through the newly formed American right wing which was deployed on several hills. At this point Lieutenant General Wilhelm von Knyphausen attacked Chadds Ford and crumpled the American left wing. As Washington’s army streamed away in retreat, he brought up elements of Nathanael Greene’s division which held off Howe’s column long enough for his army to escape to the northeast. The defeat and subsequent maneuvers left Philadelphia vulnerable. 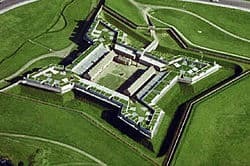 The British captured the city on September 26, beginning an occupation that would last until June 1778. General George Washington had situated the American forces, about 20,300 strong, between Head of Elk and Philadelphia. His forces were able to reconnoiter the British landing from Iron Hill near Newark, Delaware, about nine miles (14 km) to the northeast. Because of the delay disembarking from the ships, Howe did not set up a typical camp but quickly moved forward with the troops. As a result, Washington was not able to accurately gauge the strength of the opposing forces. After a skirmish at Cooch’s Bridge south of Newark, the British troops moved north and Washington abandoned a defensive encampment along the Red Clay Creek near Newport, Delaware to deploy against the British at Chadds Ford. This site was important as it was the most direct passage across the Brandywine River on the road from Baltimore to Philadelphia. On September 9, Washington positioned detachments to guard other fords above and below Chadds Ford, hoping to force the battle there. Washington employed General John Armstrong, commanding about 1,000 Pennsylvania militia, to cover Pyle’s Ford, a few hundred yards south of Chadds Ford, which was covered by Major Generals Anthony Wayne’s and Nathanael Greene’s divisions. Major General John Sullivan’s division extended northward along the Brandywine’s east banks, covering the high ground north of Chadds Ford along with Major General Adam Stephen’s division and Major General Lord Stirling’s divisions. Further upstream was a brigade under Colonel Moses Hazen covering Buffington’s Ford and Wistar’s Ford. Washington was confident that the area was secure. The British grouped forces at nearby Kennett Square. Howe, who had better information about the area than Washington, had no intention of mounting a full-scale frontal attack against the prepared American defenses. He instead employed a flanking maneuver, similar to that used in the Battle of Long Island. About 5,000 men under the command of Wilhelm von Knyphausen advanced to meet Washington’s troops at Chadds Ford. The remainder of Howe’s troops, under the command of Charles, Lord Cornwallis, marched north to Trimble’s Ford across the West Branch of the Brandywine Creek, then east to Jefferies Ford across the East Branch (two fords that Washington had overlooked), and then south to flank the American forces. From the Meetinghouse grounds, the battle continued for three miles to what is now Battlefield Park. Eventually the British pushed the Americans back but not before suffering heavy losses. The British appeared on the Americans’ right flank at around 2 p.m. With Hazen’s brigades outflanked, Sullivan, Stephen, and Stirling tried to reposition their troops to meet the unexpected British threat to their right flank. Howe was slow to attack, which bought time for the Americans to position some of their men on high ground at Birmingham Meetinghouse, about a mile (1.6 km) north of Chadds Ford. By 4 p.m., the British attacked, with Stephen’s and Stirling’s divisions receiving the brunt of the assault; both American divisions lost ground fast. Sullivan attacked a group of Hessian troops trying to outflank Stirling’s men near Meeting House Hill and bought some time for most of Stirling’s men to withdraw, but returned British fire forced Sullivan’s men to retreat. At this point, slightly after 4 pm, Washington and Greene arrived with reinforcements to try to hold off the British, who now occupied Meeting House Hill. These reinforcements, combined with the remnants of Sullivan’s, Stephen’s, and Stirling’s divisions, stopped the pursuing British for nearly an hour but were eventually forced to retreat. The Americans were also forced to leave behind many of their cannons on Meeting House Hill because almost all of their artillery horses were killed. Knyphausen, on the east bank of the Brandywine, launched an attack against the weakened American center across Chadds Ford, breaking through the divisions commanded by Wayne and William Maxwell and forcing them to retreat and leave behind most of their cannon. Armstrong’s militia, never engaged in the fighting, also decided to retreat from their positions. Further north, Greene sent Brigadier General George Weedon’s troops to cover the road just outside the town of Dilworth to hold off the British long enough for the rest of the Continental Army to retreat. Darkness brought the British pursuit to a standstill, which then allowed Weedon’s force to retreat. The defeated Americans retreated to Chester where most of them arrived at midnight, with stragglers arriving until morning. The American retreat was well-organized largely due to the efforts of Gilbert du Motier, Marquis de Lafayette, who, although wounded, created a rally point that allowed for a more orderly retreat before being treated for his wound. The official British casualty list detailed 587 casualties: 93 killed (eight officers, seven sergeants and 78 rank and file); 488 wounded (49 officers, 40 sergeants, four drummers and 395 rank and file); and six rank and file missing unaccounted for. Only 40 of the British Army’s casualties were Hessians. Historian Thomas J. McGuire writes that, “American estimates of British losses run as high as 2,000, based on distant observation and sketchy, unreliable reports”. No casualty return for the American army at Brandywine survives and no figures, official or otherwise, were ever released. Most accounts of the American loss were from the British side. One initial report by a British officer recorded American casualties at over 200 killed, around 750 wounded, and 400 prisoners taken, many of them wounded. A member of General Howe’s staff claimed that 400 rebels were buried on the field by the victors. Another British officer wrote that, “The Enemy had 502 dead in the field”. General Howe’s report to the British colonial secretary, Lord George Germain, said that the Americans, “had about 300 men killed, 600 wounded, and near 400 made prisoners”. The nearest thing to a hard figure from the American side was by Major General Nathanael Greene, who estimated that Washington’s army had lost between 1,200 and 1,300 men. On September 14, 350 wounded Americans were taken from the British camp at Dilworth to a newly established hospital at Wilmington, Delaware. This would suggest that of the “near 400” prisoners reported by Howe, only about 50 had surrendered unwounded. If General Greene’s estimate of the total American loss was accurate, then they had between 1,160 and 1,260 killed, wounded or deserted during the battle. The British also captured 11 out of 14 of the American artillery guns. Among the American wounded was the Marquis de Lafayette. In addition to losses in battle, 315 men were posted as deserters from Washington’s camp during this stage of the campaign. Although Howe had defeated the American army, his lack of cavalry prevented its total destruction. Washington had committed a serious error in leaving his right flank wide open and nearly brought about his army’s annihilation had it not been for Sullivan, Stirling and Stephen’s divisions, which fought for time. Evening was approaching and, in spite of the early start Cornwallis had made in the flanking maneuver, most of the American army was able to escape. In his report to the Continental Congress detailing the battle, Washington stated: “despite the day’s misfortune, I am pleased to announce that most of my men are in good spirits and still have the courage to fight the enemy another day”. The Continental Congress abandoned Philadelphia, first to Lancaster, Pennsylvania for one day and then to York, Pennsylvania. Military supplies were moved out of the city to Reading, Pennsylvania. 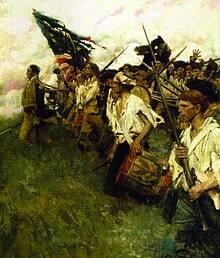 On September 26, 1777, British forces marched into Philadelphia unopposed. Eight Army National Guard units (103rd Eng Bn, A/1-104th Cav, 109th FA, 111th Inf, 113th Inf, 116th Inf, 1-175th Inf and 198th Sig Bn) and one active Regular Army Field Artillery battalion (1–5th FA) are derived from American units that participated in the Battle of Brandywine. There are only thirty currently existing units in the U.S. Army with lineages that go back to the colonial era.